KEY WEST, Florida Keys -- Discovered 500 years ago by explorer Ponce de Leon, seven tiny coral-and-sand islands lying 68 miles west of Key West beckon modern-day adventurers, birders, eco-travelers and history fans. Now known as Dry Tortugas National Park, the islands are well worth exploring as the United States National Park Service approaches its August 2016 centennial anniversary. The unspoiled Dry Tortugas area, covering 100 square miles in the Gulf of Mexico, comprises one of America's most remote national parks. Accessible to the public only by boat or seaplane, it is home to rare migratory birds and a wealth of marine life. The park's awe-inspiring centerpiece is Civil War–era Fort Jefferson, sometimes called the Gibraltar of the Gulf, which takes up almost the entire landmass of the Tortugas' Garden Key. With walls 8 feet thick and 50 feet high, it is one of the largest brick structures in the Western Hemisphere. During the Civil War Fort Jefferson served as a Union military prison for captured deserters and others. Its most famous prisoner was Dr. Samuel Mudd, convicted of conspiracy in President Abraham Lincoln's 1865 assassination but subsequently pardoned. 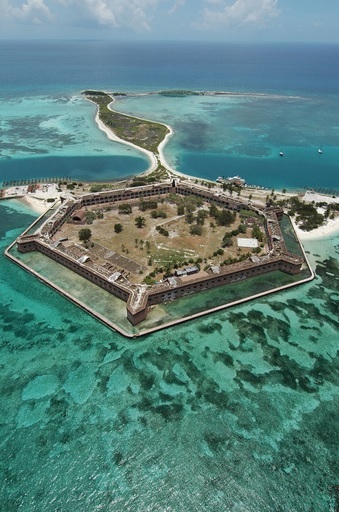 Proclaimed Fort Jefferson National Monument in 1935, the area was designated Dry Tortugas National Park in 1992. Most park visitors take the complimentary guided tour of the fort, peering through the massive structure's gun casements and gazing at the panorama of sea and sky from the open third level. Outdoor enthusiasts can "unplug" at the remote park with pristine beaches for sunning, excellent bird watching and clear blue waters for snorkeling. Garden Key is popular for overnight tent camping. The Yankee Freedom ferry is the only commercial vessel authorized to carry passengers to the park. A high-speed 110-foot catamaran, the ferry offers day trips in air-conditioned comfort. Travel time is about 2.25 hours each way, with more than 4.5 hours to experience the Dry Tortugas. Breakfast, lunch, a fort tour and snorkel gear are provided. The ferry departs from the Key West Ferry Terminal. Key West Seaplane Adventures offers morning, afternoon and full-day excursions aboard 10-passenger seaplanes. Flights depart from Key West.